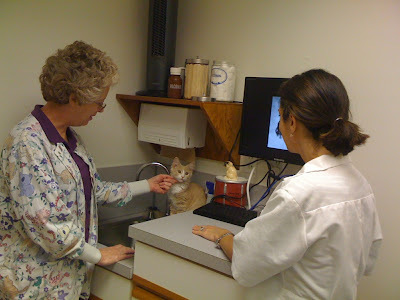 The kitties are feeling fine and visited the the Oaks Veterinary Clinic today for their shots. Oh, by the way, their names are Rocky (Rocky the Flying Squirrel) and Cleo (Cleopatra). Rocky is pictured flirting with Dr. Hannah Adams (in the white coat) and Assistant Tracey Ellis who is also a glass artist. 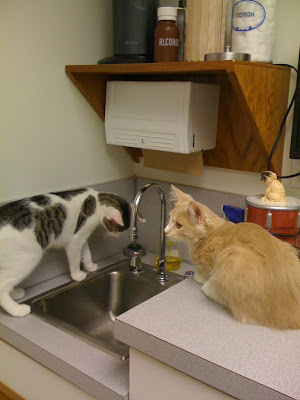 Dr. Hannah showed me a great way to entertain them by letting water drip from the faucet. They LOVE that! I'll just hope they don't figure out how to turn on the tap while I'm away. Their baby kitty photos can be found in an earlier post. All in all, Rocky and Cleo didn't mind the visit or the shots. Marc Andre - Flower Elf wins URSA! The kitties and I have been under the weather but all are fine now. They had an upper respiratory infection that they brought with them from the shelter and have had a couple of rounds of medication. I had something - who knows- but am fine. 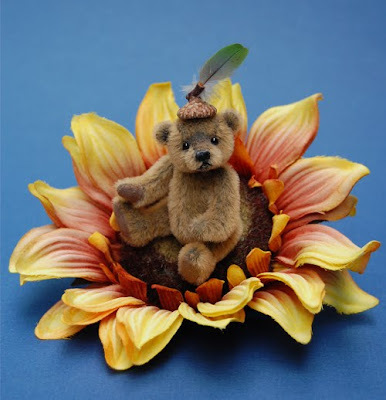 We (cats, bears, humans in residence) we thrilled to learn of our little Marc Andre the Flower Elf winning the URSA award in his category in the recent competition held by Bright Star Promotions. I must pass along how he got his name. Well, you know our love of the Pittsburgh Penguins. Their goalie is named Marc Andre Fleury (that's flower in French). Get it??? At first he was to be a leaf elf, but he just looked so cute in the middle of a sunflower. Well, that's how a little elf gets his name. There will be lots of little leaf and flower elves - hope you like them!! !